The Goan EveryDay: Who will remove this poll related advertisement? Home >> Goa >> Who will remove this poll related advertisement? Who will remove this poll related advertisement? 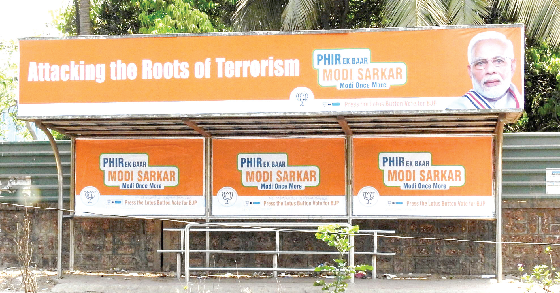 While the election authorities have removed the BJP election boards with pictures of Prime Minister Narendra Modi from bus shelters in Mormugao taluka, no such action has been initiated on similar boards in Margao. A BJP election advertisement is prominently seen on a bus shelter just outside the Margao railway station at Rawanfond. That the election authorities went about removing similar advertisements in Mormugao did not spur either the flying squads or the district election authorities to take suo moto action, raised questions whether the authorities will act only upon a complaint. The BJP election advertisement calling upon the electorate to re-elect Modi to power is prominently seen on the bus shelter on the station exit side. When a senior election official was contacted over the drive initiated by the authorities in Mormugao taluka, he said action against the advertisements was initiated since the bus shelters are public places. It’s still unclear why the same yardstick was not employed in Margao.